Discover the art of traditional French bouillabaisse with Jan Buhrman. In this class you will learn how to make a mayonnaise, a fish stock, a perfectly flavored bouillabaisse and a chocolate soufflé, with loads of tricks and tips to make it an easy meal. 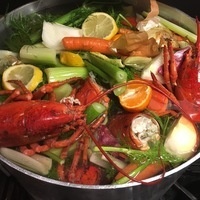 Our main course of French bouillabaisse will be artfully prepared with seafood stock, saffron, classic San Marzano tomatoes and an abundance of fresh seafood and shellfish. We’ll enjoy it with a citrus salad and for dessert, the chocolate soufflé.